Four women were detained by traffic police in two Saudi Arabian cities this week for defying the Kingdom's driving ban, according to all the women stopped. In the Red Sea port city of Jeddah Thursday, two women, Sahar Naseef and Tamador Alyami, were stopped by police after being spotted in a car on one of the city's main thoroughfares. ne of Saudi Arabia's most prominent and popular clerics has issued a stark warning to the Saudi government, saying it must take serious steps toward instituting reform, stamping out corruption and releasing political detainees "before violence is kindled"
In an open letter published online over the weekend, Salman Al-Oadah described a rising tide of anger in the deeply conservative kingdom, writing that "negative feelings have been accumulating for a long time" in Saudi Arabia. It's the 17th time Jordan has gone to the polls to elect a parliament since becoming a nation in 1946, but Wednesday's balloting is an election of firsts. For the first time, the country has allowed observers. It's also the first time that an independent election commission will oversee the polling. These deliberate steps at transparency are crucial for a country that's under a great deal of political strain - and whose stability has ramifications for the world outside its borders. A 70-year-old man in Saudi Arabia who is the focus of outrage from human rights workers reportedly for marrying a 15-year-old girl says she's not a teenager, but a woman. "She is not 15, as everybody claims," he told CNN on Tuesday. "She's 25 years old, and she's mature enough to make her own decisions. ... I was fooled by the girl's family." The marriage came to light when the man complained to a local official after his new wife left him, saying the girl's family had taken her back and he'd been ripped off for a large dowry he paid. In Saudi Arabia, there is no law that stipulates a minimum age for marriage, but human rights groups are objecting and promising to give her legal help if she is required to dispute the union in court. Saudi Arabia's king has named Prince Mohammed bin Nayef as interior minister, making him the first in the next generation of the Saudi royal family to rise to such a powerful post. King Abdullah issued the royal order ousting Interior Minister Ahmed bin Abdulaziz, who had been named to the position in June and is Prince Nayef's uncle, the state-run Saudi Press Agency reported. The death toll from several attacks across Iraq rose Monday to 76, Interior Ministry officials said. The deadliest attacks happened in the town of Taji, roughly 20 miles north of Baghdad, where a car bomb and four roadside bombs exploded in a residential complex, killing 32 people and wounding 43, authorities said. In another attack, at an Iraqi military base north of Baghdad, militants armed with mortars and small arms killed at least 15 soldiers, according to the officials. Former Yemeni President Ali Abdullah Saleh was admitted Sunday to a military hospital in Sanaa, the second time that he's been to a hospital this month, a government official said. He suffered extensive burns and a collapsed lung in a June 2011 strike on the mosque in Yemen's presidential compound, a U.S. government official said then. In subsequent months, he has gotten continued medical treatment in various places, including in Saudi Arabia and New York. The Yemeni official said Sunday that Saleh was in the hospital for "a scheduled checkup, not an emergency," while acknowledging he continues to face health issues. Yemeni soldiers gather at the site where two suicide bombers blew up a vehicle at an elite Republican Guard camp in Bayda. The death toll from a sophisticated attack by Islamic extremists against soldiers in Yemen jumped to 177 Tuesday, three Yemeni security officials told CNN. Air raids on militant positions since the attack have left at least 42 militants dead in Abyan province, security officials said. 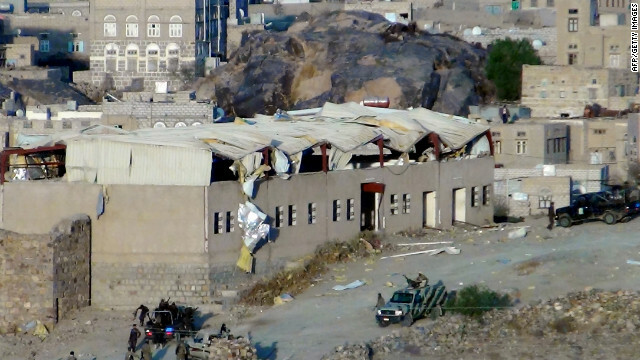 The attack Sunday at an army base by Ansar al-Sharia, which is allied with al Qaeda in the Arabian Peninsula (AQAP), originally claimed the lives of 90 soldiers and wounded many others. It "illustrates AQAP's complete disregard for human life," U.S. Secretary of State Hillary Clinton said in a statement. She vowed that the United States will continue to support Yemen's new President Abdurabu Hadi "and the Yemeni people as they work to realize their aspirations for a brighter and more prosperous future." The attack was a humiliating defeat to Yemen's army in a power struggle against AQAP. The militants seized large amounts of weaponry - including rocket launchers, mortars, armored vehicles, and tanks - and appeared to have had help from within the security apparatus, according to Yemeni officials. The bloodbath took place near Zinjibar, a town on the Arabian Sea where Ansar al-Sharia has been active for nearly a year. There is only one name on the ballot Tuesday as Yemen goes to the polls to replace longtime ruler Ali Abdullah Saleh. And yet, the election is a historic one because it signifies the formal end of Saleh's 33-year reign. Vice President Abdurabu Mansur Hadi, who took over when Saleh stepped down in November after months of protests, insisted on standing for election. He has said he wants to make his presidency official. Security around the capital and elsewhere was tight Tuesday. Around Sanaa, posters of Hadi has replaced images of Saleh. "A New President for a New Yemen," read a large banner that hung from Change Square, which had been the epicenter of the anti-government movement last year. Some who took part in the protests said they were not particularly excited about Tuesday's vote. "Maybe you can call them elections," said Nadia Abdullah. "But for me, elections should have more than one candidate." Abdullah said she would stand by Hadi as long as he made good on his promises. "If he goes through with it, we will stand hand-in-hand with him," she said. "If he doesn't, or if we see a lot of game-playing between him and the government, I believe the youth will remain in the squares. They would say, 'Leave,' as they did to Ali Abdullah Saleh." The 65-year-old Hadi is a British-, Egyptian- and Soviet-trained army officer, recently promoted to the rank of field marshal. He has served as vice president since 1994 and is running for a two-year term as president on pledges of improving security and creating more jobs. But he's never had much of a power base of his own, and Yemen's problems will take much longer to fix than the two-year mandate he's expected to receive. It's the poorest country in the Middle East, with a severe shortage of water and rising levels of malnutrition among its population of about 25 million. A car bomb exploded in Aden on Friday, killing the commander of a Yemeni counterterrorism unit and seriously injuring two children, according to a Yemeni government official who is not authorized to speak to the media. Major Gen. Ali Al-Hajji commanded a battalion of Central Security Forces troops, which includes counterterrorism units, the official said. The bomb was planted in Al-Hajji's car and exploded while the vehicle was traveling near the 22 May Soccer Stadium, according to the official. Two children standing near the car when it exploded, ages 5 and 14, were seriously injured by the blast and were taken to a hospital, the official said. Thousands of women marched toward Yemen's foreign ministry in the capital, Sanaa, Monday, demanding U.N. intervention in the ongoing unrest in the Persian Gulf nation, residents and eyewitnesses said. The protest comes a day after a female protester became the first woman killed in a demonstration against the government, according to opposition activists. The women called for sanctions against President Ali Abdullah Saleh and asked that he be tried by the International Criminal Court. The women also alleged that snipers were on the rooftop of the foreign ministry Sunday. The protests came hours after gunfire and loud explosions reverberated throughout the capital early Monday. Yemeni security forces opened fired on demonstrators gathering for a planned march in Sanaa on Sunday, killing four people and injuring 37 others, according to a medic on the scene. The reported violence comes a day after at least 10 people were killed and 38 others wounded in clashes in the capital, said Mohammed Al-Qubati, who works at a field hospital in Change Square, the center of the protests. Molhim Saeed, another medic in Change Square, called Saturday "a sad day for the revolution." "The marches were peaceful and the youth were unarmed. They refused to even fight back when they were being shot at," Saeed said. There was no immediate comment from the government. 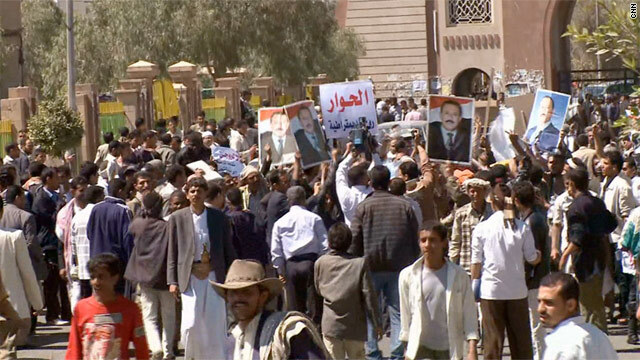 Demonstrators have taken to the streets regularly to call for an end to the rule of President Ali Abdullah Saleh. [Updated at 7:52 p.m. ET ] Explosions rocked two government security offices Thursday morning in Aden, Yemen. The first explosion occurred at the city's political security headquarters, while the other was at al-Mualla police station, witnesses said. No casualties were reported among security forces from either explosion, a security official at al-Mualla police station said. Explosives had been hidden behind the police station, the official said. In all, at least four blasts were heard over the course of an hour in the city's al-Mansoora and Mualla districts. Residents said that security forces fatally shot a child minutes after the explosions. "Police officers went on rooftops and started shooting," said Khaled Saleem, a resident of al-Mualla. No immediate claim of responsibility was made, and speculation differed over who could have been behind the attacks. Dozens of suspected al Qaeda militants escaped from a jail in the Yemeni city of Mukalla Wednesday, according to a senior security official. CNN could not independently verify that the escapees were members of al Qaeda. A soldier and a prisoner were killed and two soldiers were injured in the incident, said the security official who asked to remain anonymous because he is not authorized to speak to the media. Armed militants began attacking the prison at about 8 a.m. Wednesday, witnesses said. They fired heavy artillery before the escape. Recent clashes in the southern province of Abyan killed seven Yemeni soldiers and 17 militants. The fighting was mainly concentrated in the cities of Zinjibar and Jaar. Government troops have been battling both anti-government tribal forces and Islamic militants, including al Qaeda in the Arabian Peninsula. Women get into the backseat of a vehicle in Saudi Arabia's capital Riyadh on June 14, 2011. Saudi women have been encouraged to challenge the status quo and get behind the wheel Friday. The initiative is called "Women2Drive," a campaign demanding the right for women to drive and travel freely in Saudi Arabia. Rebecca Black's 'Friday' video had gotten more than 170 million hits on YouTube. Where's 'Friday'? : This will be your first Friday in, well it seems like forever, that you can't kick off with a Rebecca Black "Friday" video fix from YouTube. Entertainment Weekly reports that the clip, which had more than 167 million views, has been pulled. “This video is no longer available due to a copyright claim by Rebecca Black. Sorry about that” is what you'll read when you click on the link. The website NME.com reports that the video was pulled in a dispute with Ark Music, which wrote the track's music. Solar power plant: Friday is the official groundbreaking for what is billed as the world's largest solar energy facility. The Blythe Solar Power Project is being constructed on 7,000 acres of public lands in the desert of Riverside County, California. When it is completed, the solar power plant will produce electricity to power 300,000 single-family homes for a year, its backers say. Using the plant's solar-generated electricity rather than fossil fuels will also reduce carbon dioxide emissions by 2 million tons a year. During construction, the plant is expected to create 1,066 construction jobs and almost 300 permanent jobs. Secretary of the Interior Ken Salazar joins other state and local officials for Friday's groundbreaking. Saudi driving: Saudi women are being encouraged to challenge the status quo and get behind the wheel Friday. Though there are no traffic laws that make it illegal for women to drive in Saudi Arabia, religious edicts are often interpreted as a ban against female drivers. The day is expected to be a test of wills - and authority - between police and the campaign, which has been publicized by Facebook, Twitter and other social media. 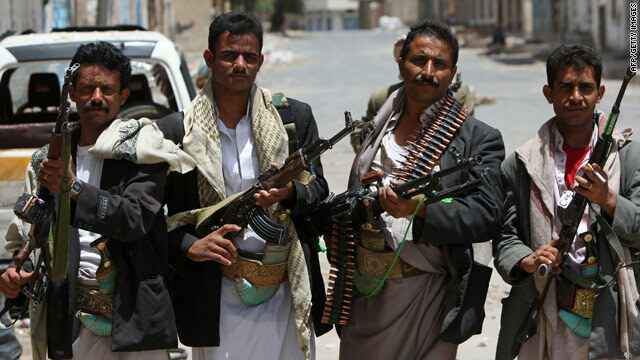 Armed dissident tribesmen patrol a damaged area in Sanaa, Yemen, on Thursday. The United States has resumed airstrikes in Yemen and believes it killed a top al Qaeda insurgent there, a U.S. military official said on Thursday. Abu Ali al-Harithi, "described as one of the most dangerous al Qaeda commanders in Shabwa province," has been killed in Yemeni security operations, state-run TV reported on Thursday, citing an official military source. The New York Times reported on Thursday that American jets killed him in an airstrike last Friday. A U.S. military official with knowledge of the Yemen campaign told CNN that U.S. military-led air operations recently resumed after a pause of some months. He also said the United States believes it likely killed al-Harithi in an airstrike in southern Yemen in recent days. But he cautioned its "very difficult" to confirm the killing. Yemen's army repelled an attack on a military position Tuesday by al Qaeda in the Arabian Peninsula, killing 12 militants and wounding five, a Yemeni official told CNN, citing sources at the Interior Ministry in Sanaa. The official, who spoke on condition of not being named because he is not authorized to talk to the media, said the attack occurred east of the city of Lawdar, in Abyan province in southwest Yemen. The attack came on a day that Yemen's embattled president told the country's largest opposition bloc he would step down at the beginning of next year, a ruling party official told CNN. The opposition rejected the offer, demanding that Ali Abdullah Saleh resign immediately. But Saleh pushed back against opponents - including some of his own top generals - defying calls for him to quit. Clashes broke out between pro- and anti-government protesters outside Sanaa University in Yemen's capital Monday morning. About 200 anti-government protesters were rallying at the site, when about 300 counter-demonstrators carrying pictures of President Ali Abdullah Saleh confronted them. knives. Some security forces at the scene tried to separate the two sides, while others stood on the sidelines. 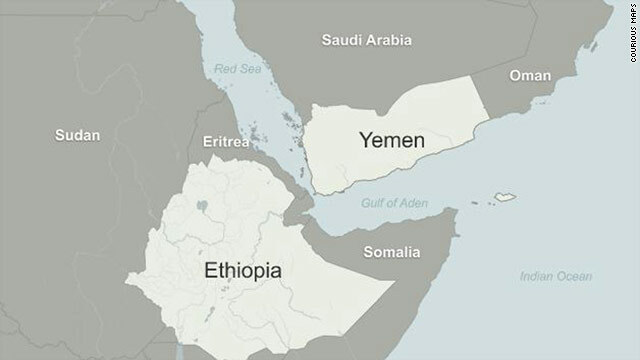 More than 80 people are feared drowned after two boats capsized off the coast of Yemen, the coast guard in Aden said Monday. Yemen's Interior Ministry confirmed the incident on their state-run news site, adding that the two boats capsized in two different accidents and at two different sites. According to a report on the official website of Yemen’s ruling party, three survivors have been recovered, all Somalis, from a boat that carried 46 people. The second boat was believed to have 35 to 40 people aboard. Most of those missing are thought to be from Ethiopia. Search efforts were underway for any more possible survivors, coast guard officials are quoted as saying.